CDG for H&M. A more detailed view on the items, here. The entire craziness surrounding the realease of pieces made by Comme des Garcons took over me too from the very beginning. Having that feeling when someone is secretly organising a surprise party. And I was by no means disappointed. Here is an editorial, which puts a warmer light onto this collection. I mean, it's one thing to see campaign photos, and something completely different to see them styled for daily casual wear. Nippon Vogue November 2008. Erin Wasson by David Mushegaistyle. Styling, Erin Wasson. Clothes: Comme des Garcons 4 H&M. 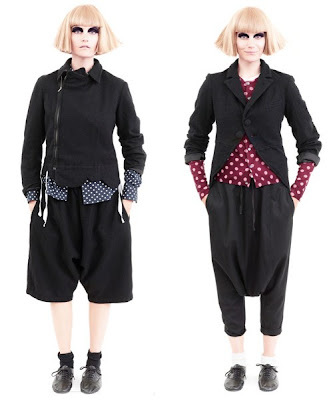 The Comme des Garçons for H&M by Rei Kawakubo’s collection debuting at H&M’s new Tokyo store on November 8th and worldwide on November 13th. It's a highly anticipated event. Until now, I've been following on the presentation photos, editorials and individual photos of the items. Judging by all these, the fabrics in the clothes seem to be quite comfy: stretch wool, boiled wool, wool jersey, gabardine, cotton poplin and merino wool. Color range: black, white, midnight blue, red and rose. What's not to love? This really makes me crazy that we do not have an H&M in my city. That steel grey ruffle dress and blue long peacoat is a must have! Quirks - Jump On The Bandwagon!